The Peter Wentz House in Montgomery County, PA. The exterior was originally painted in an intriguing color combination of black and white. The Peter Wentz House was built in 1758 by Peter Wentz, Jr. The building structure presents an unusual combination of a Georgian central hall plan with other architectural elements of German influence. 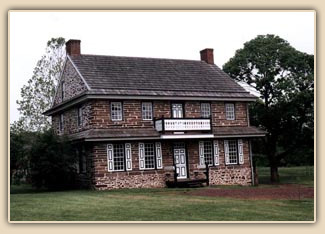 Its historical significance is enhanced by the fact that George Washington twice used the farmstead as his headquarters, lodging there while planning strategies for the Battle of Germantown. Now owned by Montgomery County, the house was restored in 1975-76 under the direction of architect John D. Milner. The chosen period of interpretation was 1777, corresponding to the year of Washington's visits. 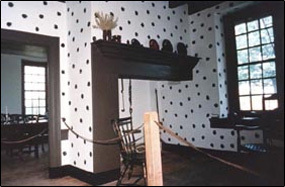 During his investigation, Welsh discovered bold and colorful sponge-painting and brushed decoration on many of the house's plaster walls and dadoes. After working to uncover the original finishes, Welsh documented and illustrated the findings in an article in the APT Bulletin (vol. 7, no. 2, 1975). 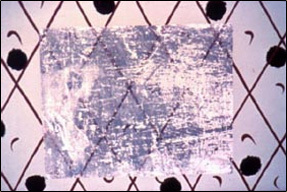 He collaborated with paint chemist A. Richard Fitch to formulate paints with historically accurate colors and textures. All original decorations were executed in calcimine paints and whitewashes. 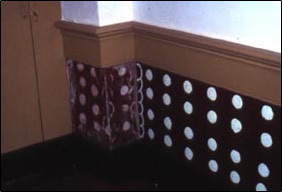 Welsh restored the decorative painting throughout the house, leaving several protected sections of original painted decoration visible as a historic record. Frank S. Welsh in 1975 restoring the brush- and sponge-painted dado in the 2nd floor Hall. 2nd floor Hall with views into SE and SW rooms. 2nd floor NW room with black sponge-painted dado and yellow wood trim. 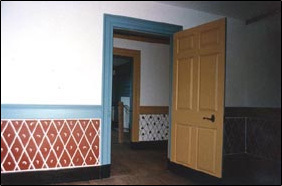 2nd floor room with red and white hand-painted dado and blue trim. 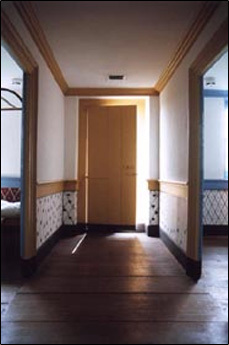 The dado in the Hall is visible through the doorway. Notice the use of black on the baseboards and how it is also carried across the base of the door trim and the door. 1st floor Hall - original sponge-painted decortion is exposed at the jamb of the front doorway. 2nd floor NE room plaster dado showing the exposed original finishes surrounded by restored decorative painting. 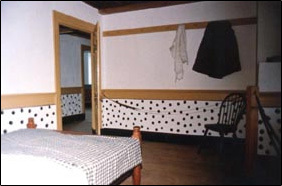 2nd floor NE room with white and black hand-painted dado. The wood trim and paneling in this room are blue, and the interior of the closets and cupboards are reddish orange - a color made with the pigment red lead that was typically used for cupboard interiors. 1st floor Winter kitchen, sponge painted in black in an all-over pattern. 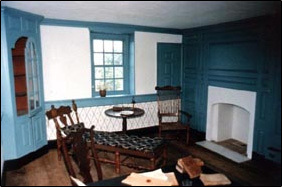 The Summer Kitchen (not pictured) originally was decorated in a similar fashion. These vibrant colors and striking decorations recently captured the attention of Early American Homes and are boldly featured on the cover of the June 2000 issue. 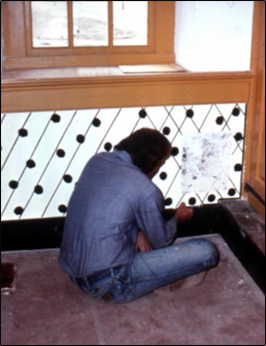 An addendum in the February 2001 issue describes in greater depth the process of Frank S. Welsh's analysis and restoration of the decorative painting at the Peter Wentz House.